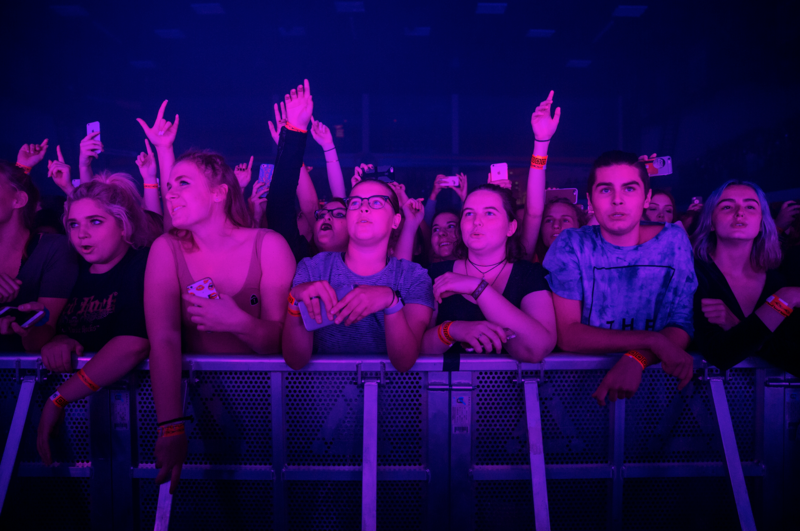 Amongst all the outrageous costumes, party hopping and people watching that took place this Halloweekend, Kent State University also had the privilege of hosting The 1975. They performed on Sunday, Oct. 30 at the M.A.C. Center for a portion of their North American tour. The 1975, a group misunderstood by many across the globe, know how to put on a show and accentuate passion. The group put on a display only able to be accurately comprehended through existing in the very room as they graced the stage. The attempt was aimed at bringing you into the interlacings of their circle. From the start, the audience was held captive through use of simplistic lights and dreamy audio, succeeding in creating a buildup of tension and anticipation for what was yet to come. Front man Matty Healy took control of the stage immediately, opening with fan favorite, “Love Me,” from the band’s award winning, most recent album, “I like it when you sleep, for you are so beautiful yet so unaware of it”. The show consisted of the band’s vocalized, raw, confession-like monologues mixed with instrumental melodies taken from both their first and second albums. Each piece performed provoked a new emotional sensation from viewers, ranging from togetherness and outward vulnerability to utter young carelessness and egocentricity. Sequences of stunning visuals heavily accompanied the band’s sound, creating an aura all their own. The images captivated those watching, shifting in regards to the change in both mood and music. The only breaks taken were solely for Healy to take swigs from a glass of red wine and a couple drags of a cigarette. With each progression, the audience craved more and more, shifting closer to the front of the room. Warmth moved through the crowd quite literally, while also quite figuratively, as each were forced to focus on their current presence in the space. Aside from a couple clearly worded thank you’s and Matty Healy spouting British accented thoughts on politics and the importance of loving one another compassionately, little was spoken from any given member of the band. Matty, Ross, Adam, George and saxophone player, John, focused intently on what was occurring in front of them, ignoring outside influence almost entirely. When they were done, they really were done; they disappeared from view immediately after shutting off every light source in the room without another word. Those paying witness were left breathless and starry eyed.